– We were operating on AX 2012 R3 CU8. – We had a BOM setup where BOM lines had the ‘Resource consumption’ flag turned on. – The BOM lines were linked to a specific Route operation from the Route on the FG. – The Resource Requirements on the linked Route Operations were tied to Resource Groups which had defaulting Input Locations. – A Production Order was created for the FG and was released to create the Raw Material Picking work based on Warehouse Management Processing. However, when looking at the Raw Material Picking work for the given Production Order, the Put location was not being assigned based on the Input Location from the Resource. In spending a considerable amount of time investigating the issue, I found that there are a number of Setup and Configuration items that should be intact in order for Raw material picking work to assign the Input Location from the Resource on the Put work type. As a result of this, I’m writing this as a Checklist of items for consideration if you are having such an issue. 1. In the BOM line form, your component items need to be linked to a specific ‘Oper No’. 2. 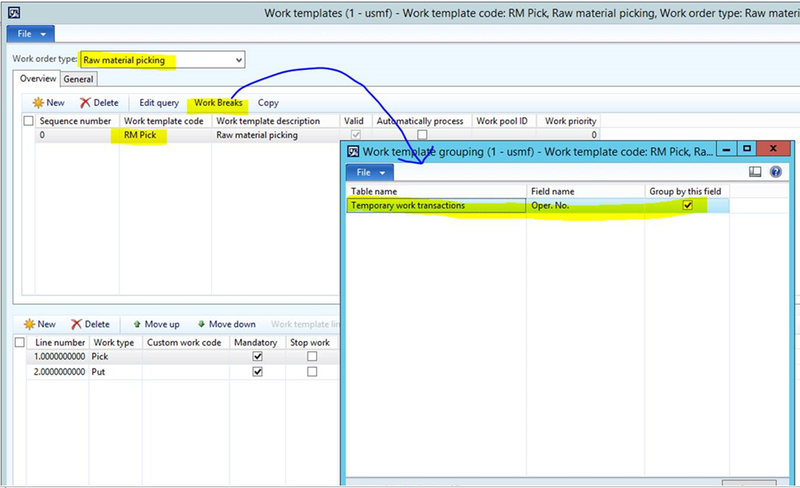 In the Work template for the ‘Raw material picking’ Work order type, you need to have a Work Break that groups by ‘Oper No’. 3. In the Location directive for the ‘Raw material picking’ Work order type, you need to make sure that you don’t have a specific Location or Location Profile hard-coded in the Put location directive. 4. For the Master plan that you have configured as the Current dynamic master plan in Master planning parameters, you need to have the Scheduling method set to ‘Job scheduling’. 5. In the Status area of Production control parameters, you need to make sure that you have all of the options marked for Job scheduled. 6. 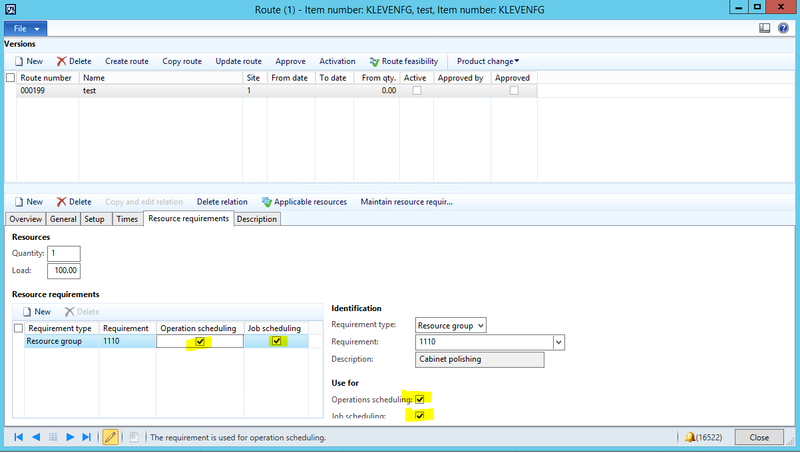 In your Route operations, you need to have both the ‘Operations scheduling’ and ‘Job scheduling’ options flagged. 7. 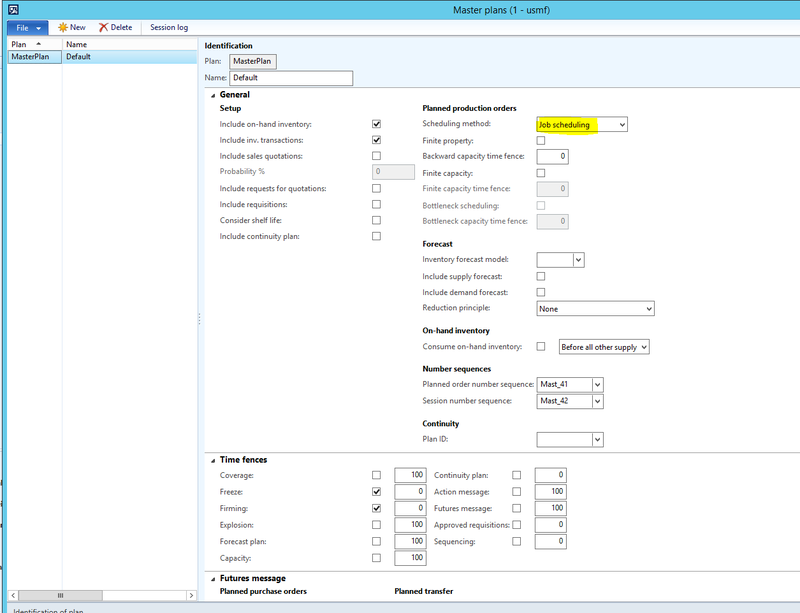 If you have a Route group linked to your Route operations, you should ensure that the Capacity option is turned on for both the Setup and Process Job types.